We're trying to set up registration for our workshops. We initiatlly listed everything as a product, we could check off which classe people wanted to register for, it showed the total at the bottom of the products, it was great. But there was no way to limit the number of registrations sold per workshop. I started working with the gift registry, inventory, the quanitty gift registry, etc. I tried to follow the instructions on http://www.jotform.com/answers/519509, as this seemed to be the same thing we're trying to set up. But when I select the "Update a field value" box, I can't get the thing to allow me more than one line, so I can't get it to show up like #3 in the step by step to finish the rule to make the amounts for each class show up in a "Totals" area. I don't know where the "total price" thing comes from -- is that a separate widget? So when I tried to create rules, I couldn't get past the "If course selection is equal to "course name" Insert X into Total price -- if doesn't seem to give me this option at all. How do I get it to let me insert the amounts in the rule? 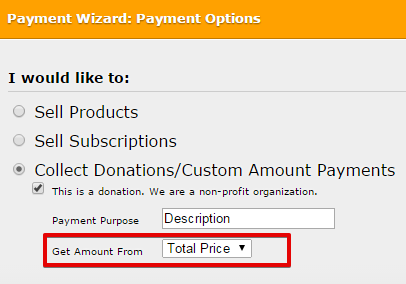 When I go to the adding payment method, the "collect donations" radial dial does NOT populate a "Total price" thing, it has a "suggested amount" and click box for "minimum." When I started a new form to try the ticket widget, it doesn't show any totals at hte bottom at all! When I tried to attach the payment, it also won't let me do any rules that are longer than 3 peices. Please help! I've spent hours making absolutely no progress, going in circles, I'm at my wits end and am ready to just tell people that they have to call me on my rotary phone to register for these workshops! If I understand you correctly, you want to have a form like this that was discussed from this thread right? I understand that you're having trouble with it but don't worry, we are here to assist you. I created a demo form (http://support.jotform.com/form/51103509051946). Please check it. You can clone it if you like then just edit it. I used the Gift Registry Widget and has a max selection of 1. Is that a separate widget? So when I tried to create rules, I couldn't get past the "If course selection is equal to "course name" Insert X into Total price -- if doesn't seem to give me this option at all. How do I get it to let me insert the amounts in the rule? The "total price" is just a normal text box field. Before you create a condition, create the "total price" text box field so that it will be the output result for the conditions. You can set up the Paypal field once all conditions had been created. You will see a drop down where to get amount from, just choose total price. Ok, I THINK I have it ALMOST figured out!! The messge above was SO helpful! Although the link did not work, I was able to put a lot of this into place and this is making a lot more sense! I am not sure how to get multiple classes to add up to a total amount, thought. In the example I linked to in the OP, the user wants people to only select ONE option, so only one amount goes to the "Total Amount" box. How do I add amounts for ALL selected classes, though, as I want users to be able to select between 1-all classes? I can't figure out a rule to have it give a total of all checked boxes in the "Total Amount" at the bottom -- I tried the form calculation widget, but it will not let me select individual classes, only the main gift registry block ("Available Workshops" on my form). The way it's working right now, I can check the box for the first three classes, but only the FIRST class amount ($20) will show up in the Total Amounts box, as it's the first rule listed. When I unselect the first listing, and select only class 2, it shows the $30 that I put into the rules. Hopefully you can help me out with this! 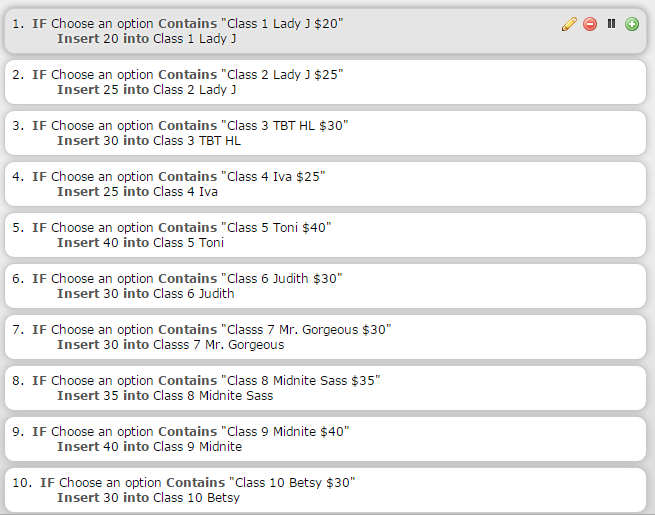 As I understand, you want to have a multiple selection and then add the total price right? It is long process but I can see you are already familiar with conditions and calculations. Let me create a demo form and get back to you later. Hope you understand. Thank you. You can clone it if you like. 1. Use the Gift Registry Widget to add the products or services. 2. Created 10 hidden text-box fields. Classes 1-10. 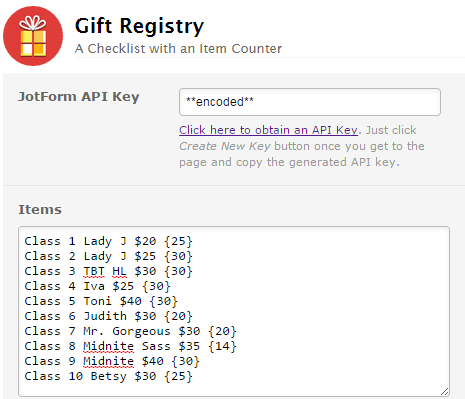 Each text box field will be the output result for each option in the Gift Registry Widget. ***Hiding a field - Just right click the form field and select "Hide Field". 3. Created a condition for each item in the Gift Registry. 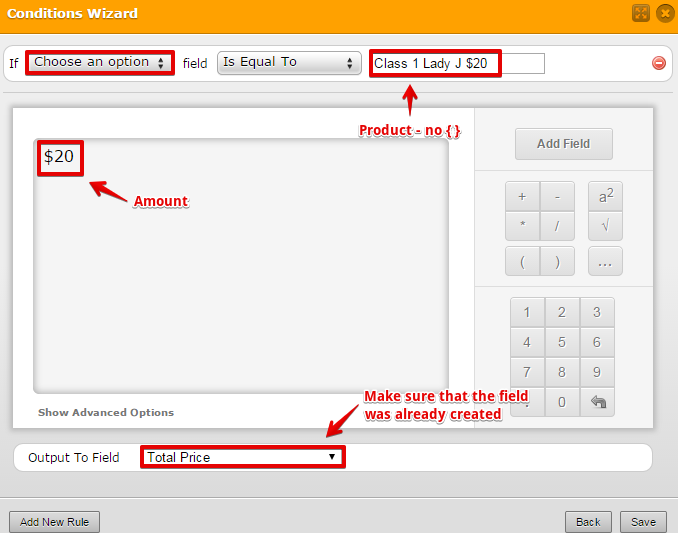 The condition is that if a product is selected then then the price of that product will be shown on the assigned text box. Just apply the same condition on the other classes. 4. 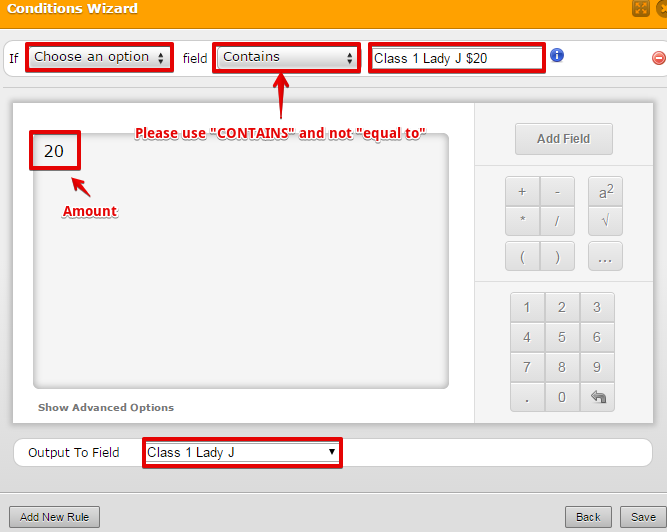 Add the form calculation widget. The fields that we'll be using are the 10 hidden text-box fields. The formula is class 1 + class 2 and so on. It means that if there is a value in class 1 and class 2, it will be added and will be shown in the total price. 5. Create a Paypal field and associate the total price. You are my hero, Jan! Thank you SO BLOODY MUCH!! FYI, the link in your second post didn't work either, but thanks to your awesome screen caps, I was able to get it done! Yay!!!!!!!!!!! You are welcome. I'm glad to hear that your issue is now fixed. Let us know if you need any help.